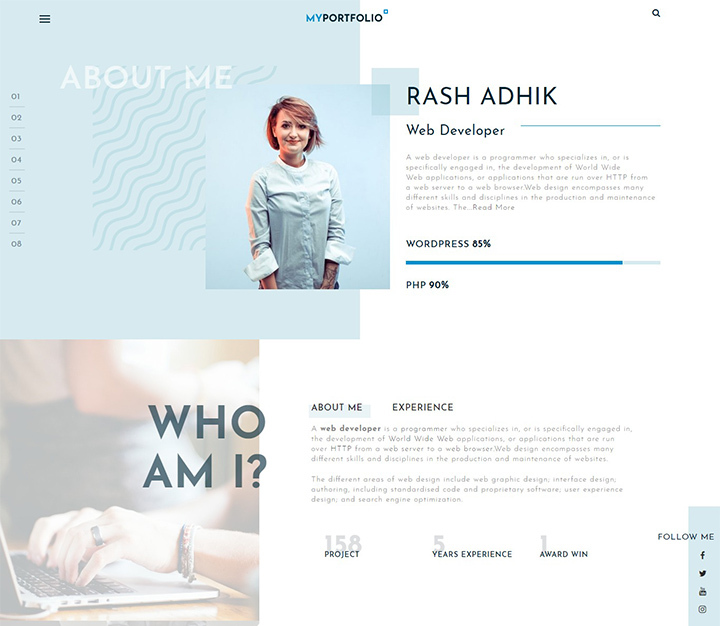 If you want to create a portfolio website and showcase your work and skills to the world, using one of the free WordPress portfolio themes may be an ideal choice. Firstly, WordPress is simple, easy and popular platform so that setting up a website takes really no time. Secondly, you’ll get a number of awesome WordPress themes free – it will save your dollars. That’s not all. WordPress community is really awesome with its ever dynamic members around the globe who provide dedicated support all the time. On top of everything, you will find plenty of free resources including child themes, plugins, extensions and more to create a website like you want. No doubts, you will build a perfect portfolio website using any of the WordPress portfolio themes free. Be yourself – logo, tagline: Yes, be yourself and present yourself as a unique person or brand. Create an impressive logo and tagline that tells who you are and what you do. Present your portfolio professionally: Needless to say that a portfolio is all about presenting. Therefore make sure to have a beautiful design that looks professional. Consult a designer or online guides for a nice design to display your previous work. Provide clear contact details: The ultimate goal of a portfolio website is to let more people know about your services and make them contact you for the services you offer. Therefore, you must provide clear contact details with the information when you are available and probably your location as well. Besides, linking your social media profiles is helpful to let them know you better. No matter if you are a freelancer, graphic designer, photographer or an artist; you need a beautiful site to showcase your portfolio. And, it’s often a lot of struggle creating a website, if you are not tech-savvy and no idea of coding. However, it is quite simple in WordPress platform with easy to use WordPress themes. There are actually so many themes so that it’s not easy to pick one. So in this post, I have kept together 15+ best free portfolio WordPress themes for 2018. Flash is a beautiful free responsive WordPress theme suitable for multipurpose websites including online portfolios. It is highly customizable, professional and simple. The theme comes with a companion plugin named ‘Flash Toolkit‘ which is specially created to make the Flash theme more user-friendly and simple. There are 18+ custom widgets in the Flash Toolkit with which you can easily add and customize portfolio sections like about, logo, call to action, services, portfolio, teams etc. The theme has deeply integrated SiteOrigin’s Page Builder plugin to work perfectly with Flash Toolkit widgets. Suffice is a free drag and drop WordPress theme with plenty of customization options and awe-inspiring design. You can create multipurpose websites including portfolio sites, corporate, business, agency, and blogs using the theme. The theme has the power of Suffice Toolkit Plugin and SiteOrigin’s page builder plugin. Suffice Toolkit plugin contains more than 16+ awesome custom widgets each providing stunning design and customizing options. Therefore anyone with little or no coding skills can easily create fully functional and professional websites in no time. In the nutshell, Suffice is a simple and sufficient WordPress theme you will ever need. 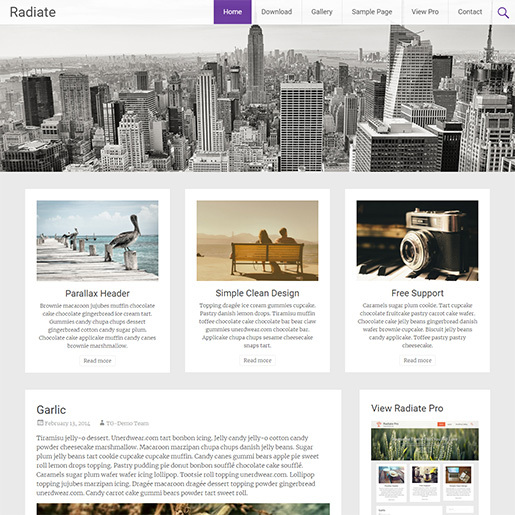 If you’re considering blogging alongside building your portfolio and improving your online presence, then Radiate is the perfect choice for you. This addition to the free WordPress portfolio theme sports a clean and modern look with a parallax header image. Radiate also comes with tons of cool theme customization options such as background customization, colour options and a sticky menu. Choose between a Tiled and a Slideshow gallery to diversify how you want to impress any viewer. Radiate is also designed to be not only fully responsive on all platforms but also speed optimized. It’s detailed documentation, customer support and Translation ready features makes it one of the best picks on this list of free WordPress portfolio themes. Fully responsive, SEO optimized design. Clean, modern layout with Parallax headers. Custom primary colour option and Background customization. Completely live customizer compatible with Custom CSS support. Well documented to cover any bases for all users. 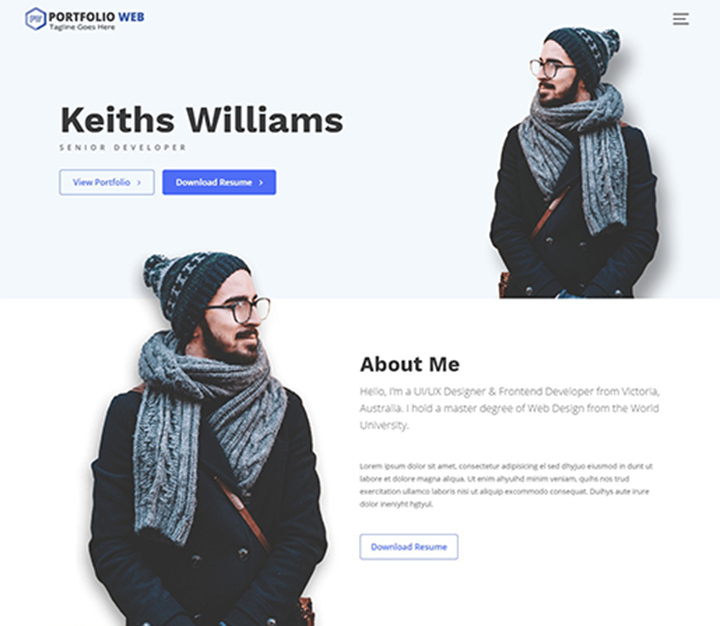 Designed with a unique concept for users looking to start an impressive portfolio site for their personal or professional use, RT Portfolio is a stunning WordPress portfolio template option for you. As it is highly customizable, you can customize and modify each element super easily. It is complete with amazing sections for gallery or portfolio, blog, About me as well as the Experiences especially to highlight your contents in an impressive manner. You also get a range of beautiful color schemes, fonts and typography options that add the extra appealing factor. Additionally, it is also easy to connect with your users by adding links to your social sites! Team section options to display team details. With an eye-catching and elaborate design, Portfolio Web is a stunning Free WordPress portfolio theme. Whether you wish to create a professional or a personal portfolio for the world to see, make a lasting impression. Complete with a retina-ready and responsive finish, it features amazing layout structures that make your hard work strikeout. A huge range of custom widgets is also added with the package for added functionality. As it is completely cross-browser compatible, flexible and dynamic, it easily adapts to all the browsers, devices and screen sizes. 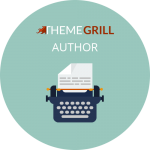 Advanced features of this theme include Advanced logo options, Unlimited Sliders as well as custom sidebar options. Easily translatable and WPML compatible. 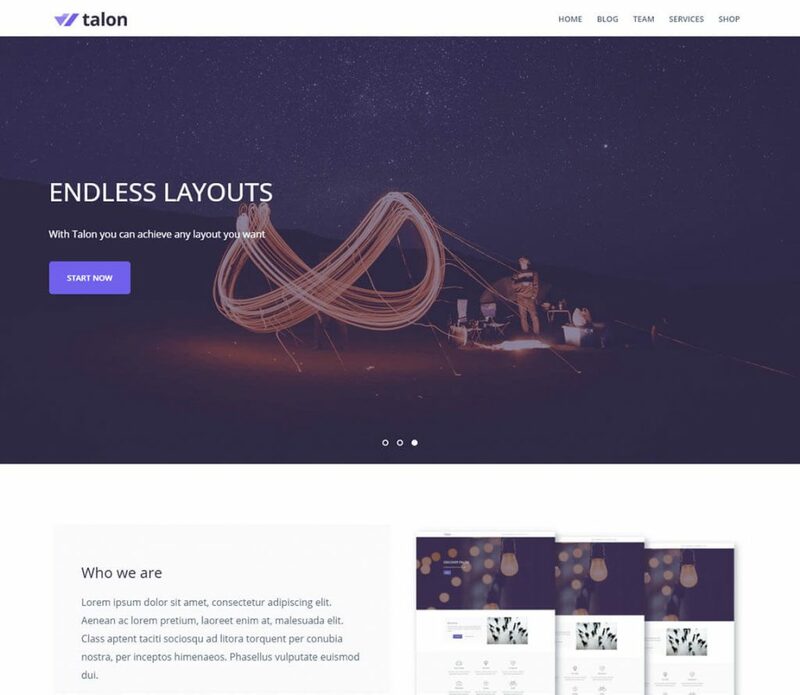 Talon is a free WordPress theme beautifully designed using the latest WordPress technologies. The theme is suitable for both the freelancers and companies to create awesome online portfolios. It offers plenty of customization opportunities so that you can create a website that represents you or product/ service in an impressive way. You can set either slider, static image with bold typography as your website header or remove the section. Moreover, it features beautifully designed sections like about, call to action, services, skills, team, latest projects etc. that make it a perfect theme for portfolio websites. Customify is a free WordPress multipurpose theme that executes style, edginess and professionalism. Perfect for anyone who wishes to leave a lasting impression with their website, this template is amazingly responsive, and mobile device friendly. And just as the name would suggest, this template is easily customizable. Thanks to the versatile framework, you can use it to display content of any niche. It is also completely compatible with the third-party popular plugins that might come in handy like Elementor, Beaver Builder, SiteOrigin, Divi, Visual Composer and more! Cross-browser compatible and versatile interface. Minimal Grid is a simple yet attractive and lightweight free WordPress portfolio theme. Ideal for those who want to draw attention to their content effectively, this template is designed with clean and minimal style in mind. It is completely responsive and retina-ready and suitable for blogging, portfolio, news, magazines and similar niche of sites. The masonry layout perfectly displays your contents in an impressive manner. It is also compatible with the latest Gutenberg Editor making it easier for you. It supports various post formats so that you have a flawless user-experience. Clean, minimal and elegant design. Retina-ready and mobile friendly layout. Visually impressive masonry grid based style. 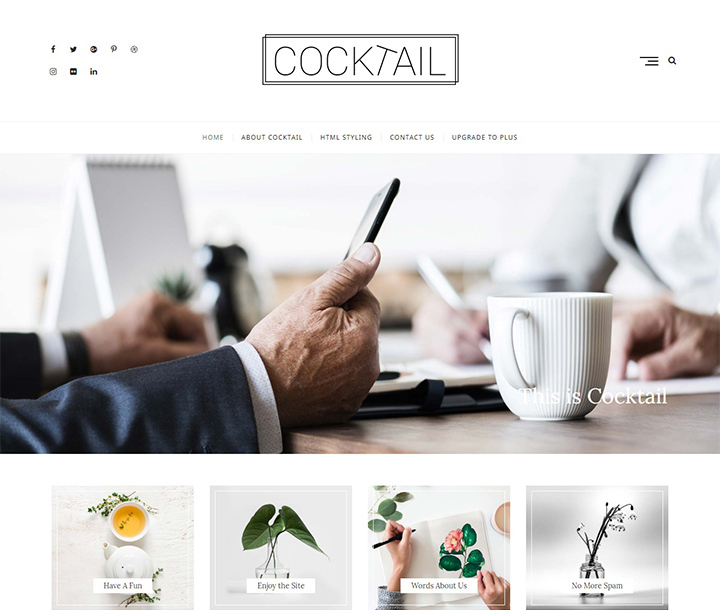 Another great option for those looking for a professional and creative free WordPress portfolio theme is Cocktail. Professional and clean in all way, the first look into the theme will leave anyone at awe. Complete with a responsive and retina-ready interface, all the options are also built with beginner’s in mind. As it is SEO optimized, your site is also sure to stand out in all the major SERPs with ease. 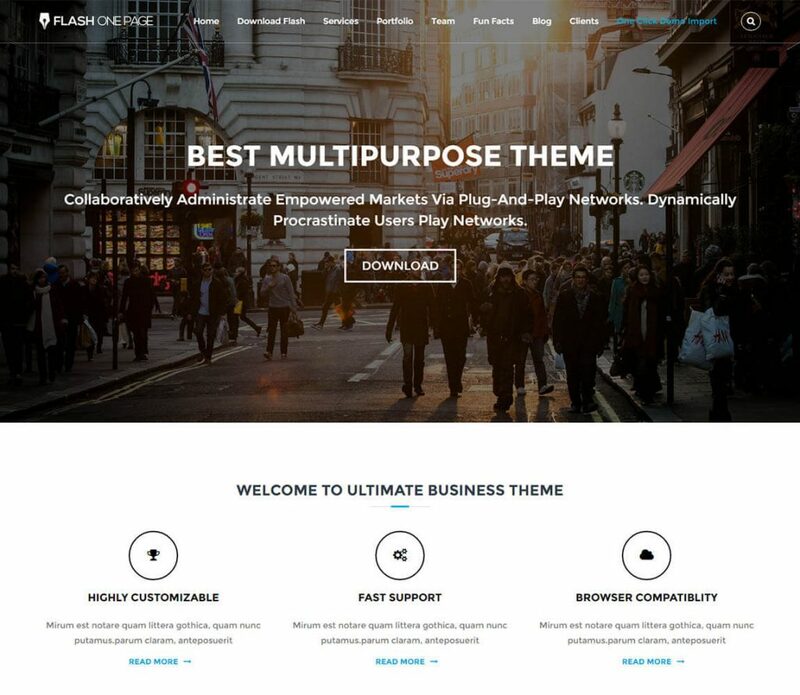 Perfect for bloggers, news, magazines and also portfolios of all niche, this theme is sure to elevate your site to the next level. Various Inner Page templates included. 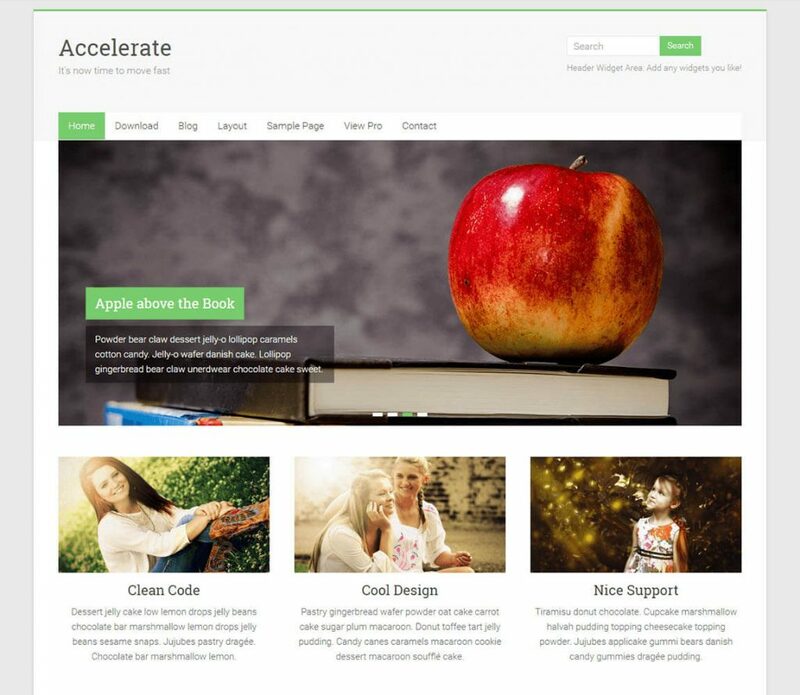 Accelerate is an amazing theme with simple and clean design that suits simple business websites as well as portfolio websites. It is a lightweight and fast loading theme that has been coded with lots of love and care. Focusing on the ease of use and better website performance, the theme uses minimal elements yet offers an impressive outlook. You can easily customize the theme and display your services, recent works, call to action buttons and more beautifully. It is fully responsive that looks great on any device including desktops and cellphones. Also, see our ultimate collection of FREE WordPress themes – 65+ Most Beautiful FREE Themes for WordPress. 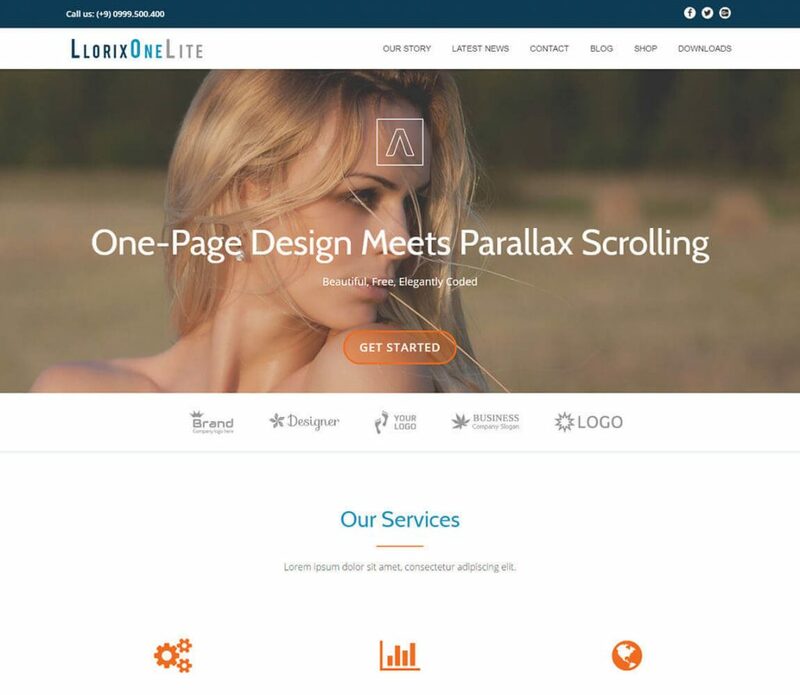 Llorix One Lite is a free Bootstrap based one page WordPress theme. It has a modern minimal look and parallax scrolling effect that is perfect enough for the professional portfolio websites. It has a full-screen hero image and blue and orange appearance with beautiful buttons and icons. You can find stylish ways to feature your services, your story, team, happy customers, latest news, contact details, social profiles and your location on Google map. What else do you want? It is indeed a fully responsive portfolio template for WordPress. 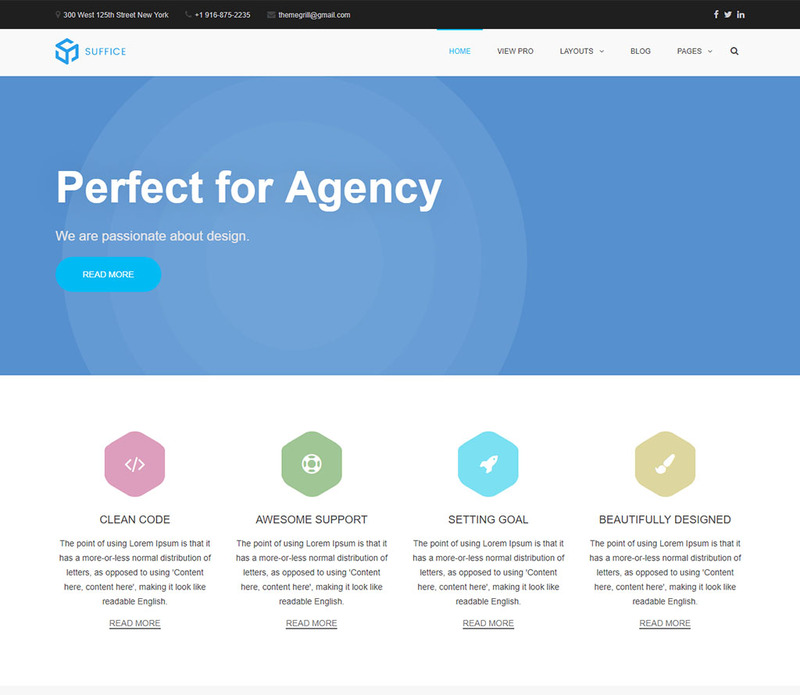 Shapely is shiny, bright and brilliant free WordPress theme. It has an outstanding layout that is sure to make your online portfolio stand out of crowd. The theme offers plenty of customization options including several homepage widgets for adding portfolio, testimonial, parallax sections, services etc. on the homepage. In addition to that, it has creative slick layouts for blog and portfolio. The theme is retina ready that is creating using razor sharp text, vibrant colors, stunning graphics and more. Create your personal portfolio using Shapely and shape your career bright. Like its name, Portfolio Gallery theme is a portfolio WordPress theme that allows you to display your portfolio in the gallery style. It has a clean flat design, easy to use interface which allows you to build an amazing portfolio in no time. You can showcase your previous works with featured images in elegant lightbox. The theme provides a number of customizable features which allow you to make different changes in layout, style, colors, fonts etc. with minimum or no coding at all. It supports WooCommerce and most of the major WordPress plugins. 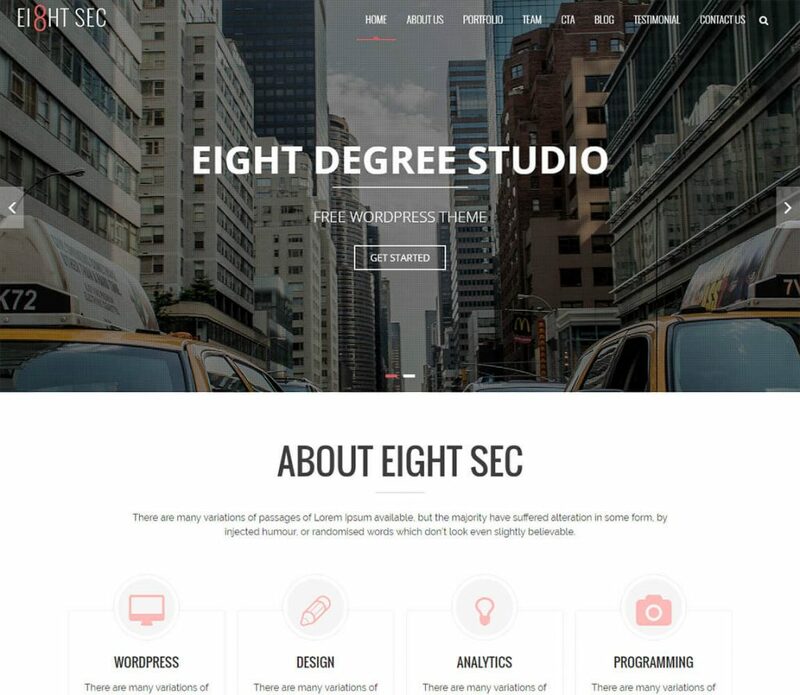 Just as the name says, Eight Sec theme is a beautiful WordPress template with eight sections. 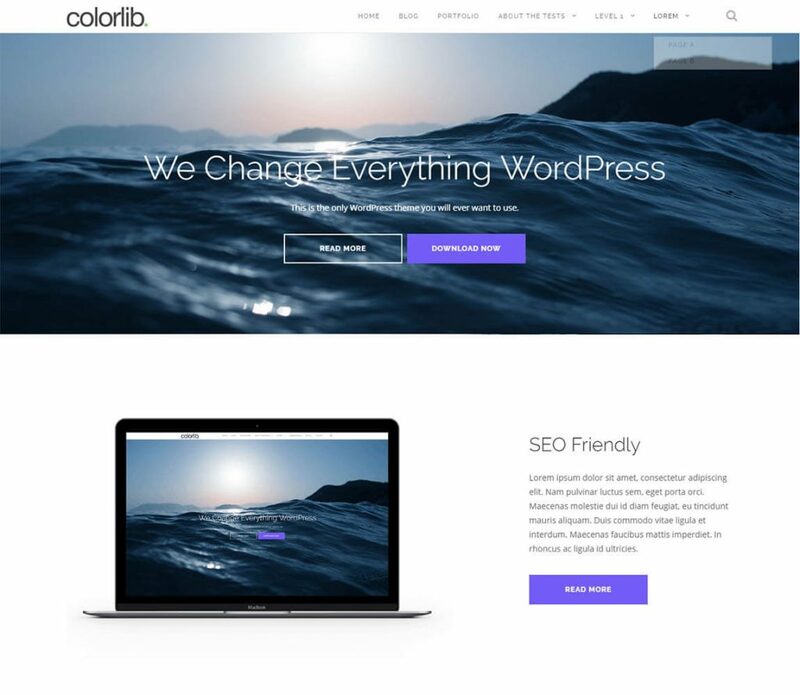 It is a one page free WordPress theme that is suitable for creating portfolio websites as well as landing pages, business, and personal websites. Based on parallax scrolling background, the theme features offers a stunning website layout. It has awesome designs for each section including about us, portfolio, team, Call to Action, blog, testimonial, contact us etc. Eight Sec theme is fully based on Customizer so that you can customize it completely in live preview mode. A lot of conventional design! It’s time for something different. And, here is a unique innovation on the WordPress platform – horizontal scrolling web design. 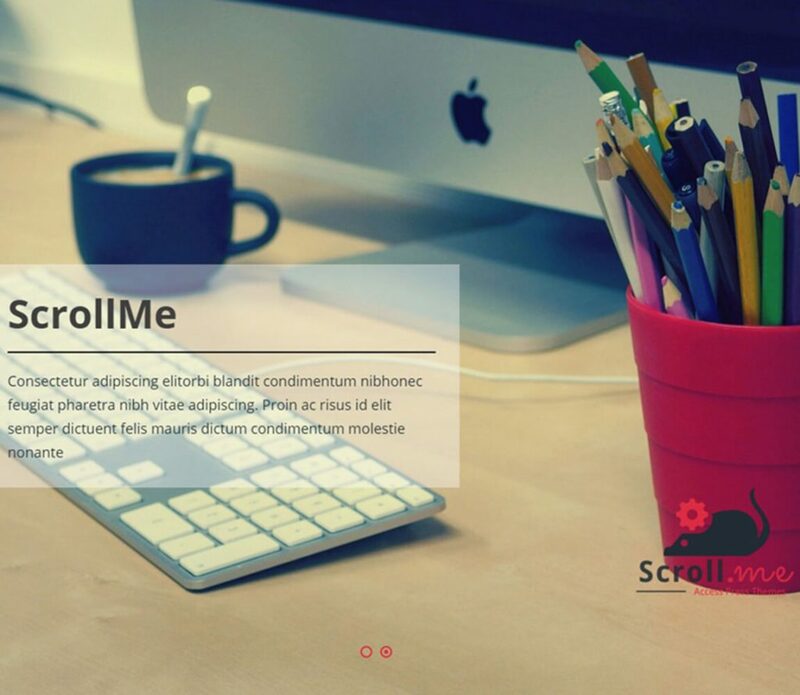 ScrollMe is a free WordPress theme with horizontal scrolling effect which is surely a new style among the similar types of themes. ScrollMe provides a bold and beautiful design with full-width horizontal slides each for your website sections like portfolio, services, blog, contact etc. 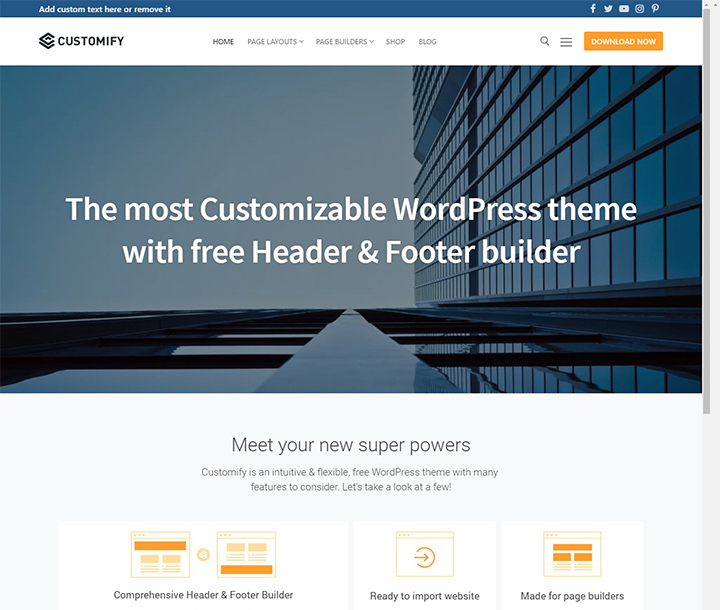 Based on latest WordPress technology ‘Customizer’, the theme allows you to change almost all the theme settings instantly. 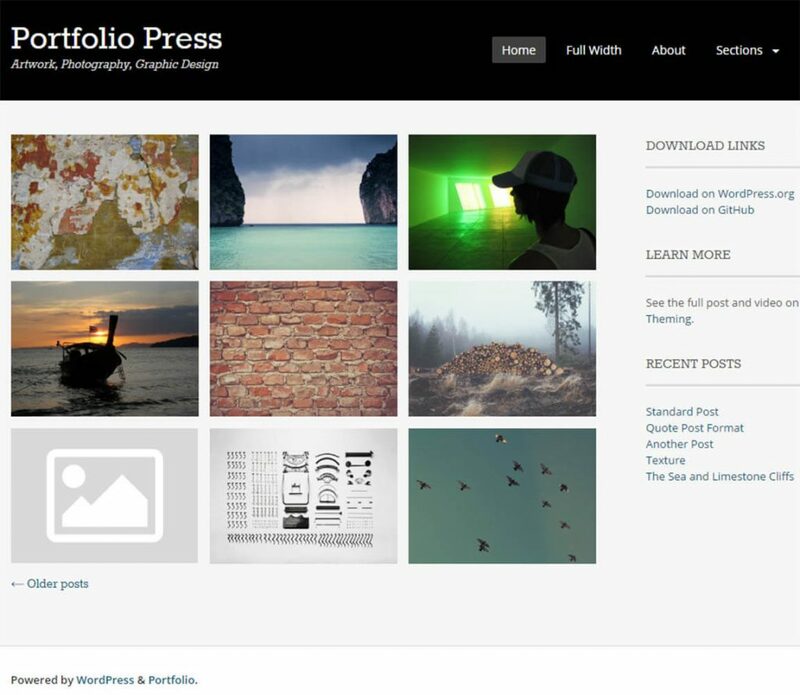 Portfolio Press is a very simple free WordPress theme for creating portfolio websites. 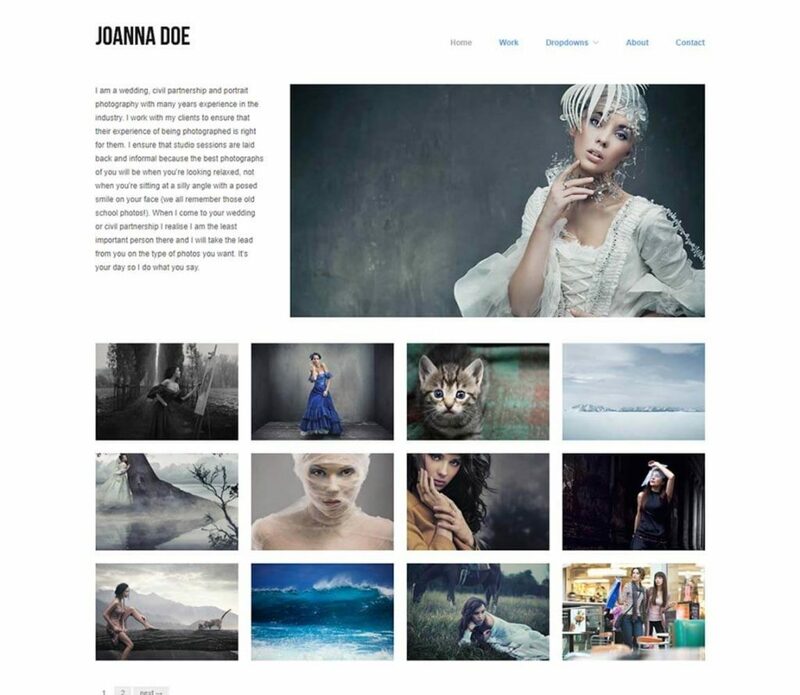 It has a grid style beautiful design where you can showcase your photography, art, websites and other projects. It has an awesome layout for blogs so that you can write about your projects and impress people. The theme is fully responsive so that your site content is sure to look amazing on any device. It follows all the WordPress standards including WordPress Customizer that allows you to customize theme options with live previews. You can download the theme FREE and instantly create an online portfolio of your own. A creative platform to showcase all of your works, Nikkon is simple and minimalistic WordPress template designed by Kaira. With simple drag and drop page builder, this theme offers you the functionality of multiple header and footer layouts as well as several options for page templates. Clean and chic, this template gives you the user-friendly aspect by integrating nicely with the top-rated plug ins such as SiteOrigins Page Builder as well as Woo Commerce. With its alluring features and design, it is well suited for any kind of websites whether it is a simple portfolio, or a company trying to showcase all of its goods. If you are looking for an all-purpose easy to use WordPress template to make your portfolio, your search ends here. 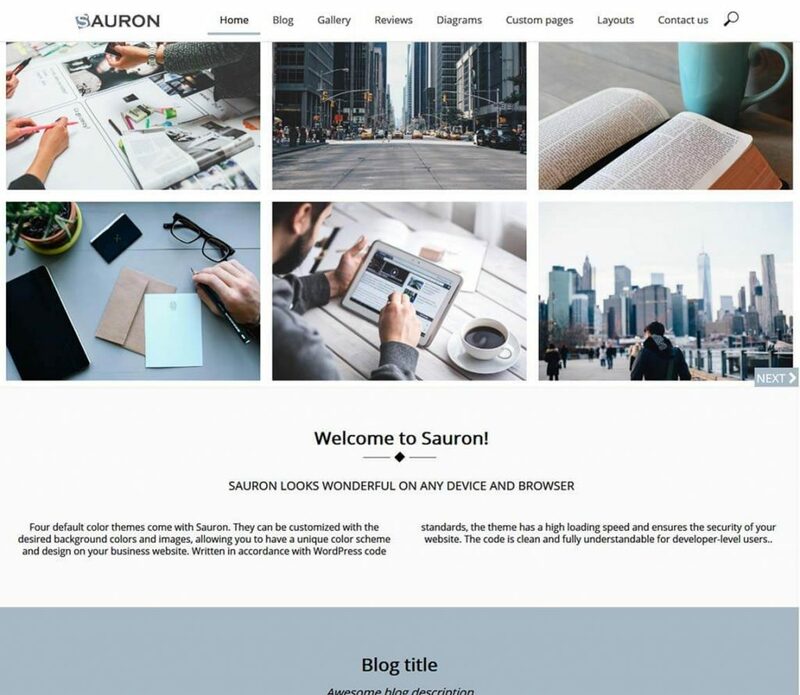 Designed by Webdorado, Sauron is a SEO-friendly theme which uses the one-page scroll and parallax feature for easy set-up of the website. 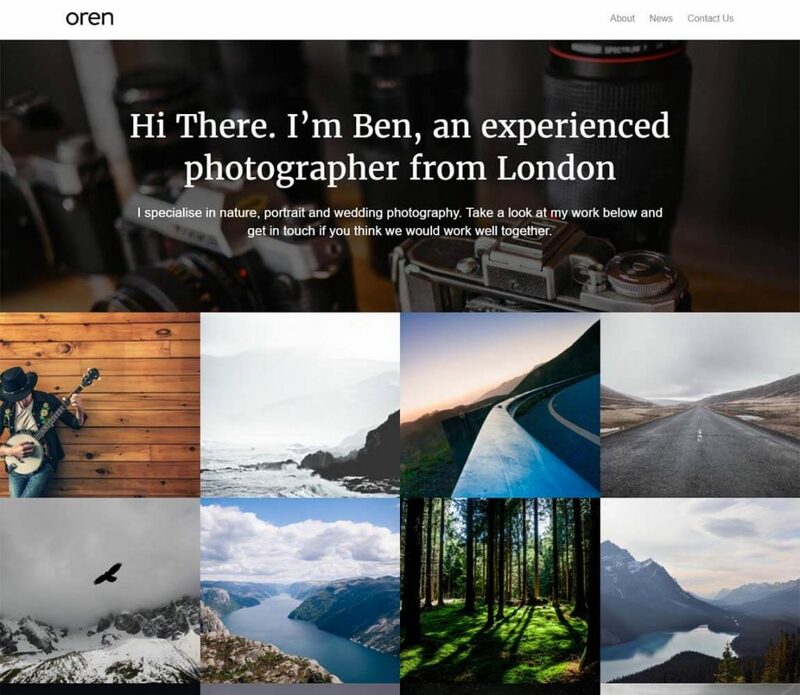 Boasting the feature of multiple customizable features, this is the perfect layout for your personal blogs, photography and even your portfolio. It is also compatible with all of the top-rated plug-in of WordPress such as JetPack, WooCommerce, BuddyPress, as well as Photo Gallery, Slider WD and Contact Form 7. You also have the option to preview the free version before investing in the premium version at the cost of $40 a year. A beautiful way to portray all of your works, Orvis is a creative approach to your ordinary website to leave a lasting impression. The clean design presented by Automattic emphasizes on your creative work with less drama on the overall website. 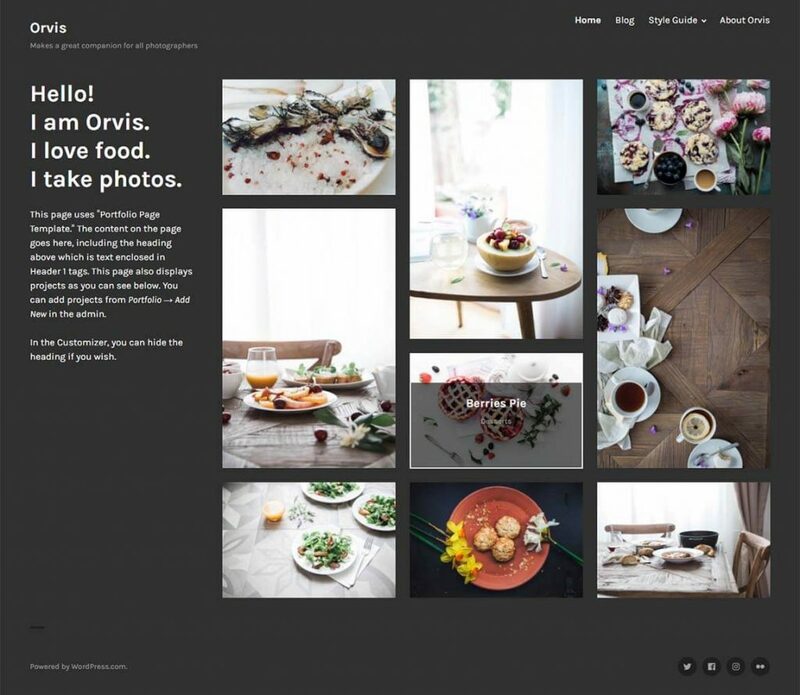 Designed with photographers and designers in mind, this elegant theme is perfect for them. The theme works with the Portfolio feature of the WordPress and provides you with the option to choose from multiple layouts and organizing functions. Along with it, this template also features the social media menu with perfectly sized icons. Featured images appear in several places including archive pages. For the minimalist in you, we have yet another template lined up for you. 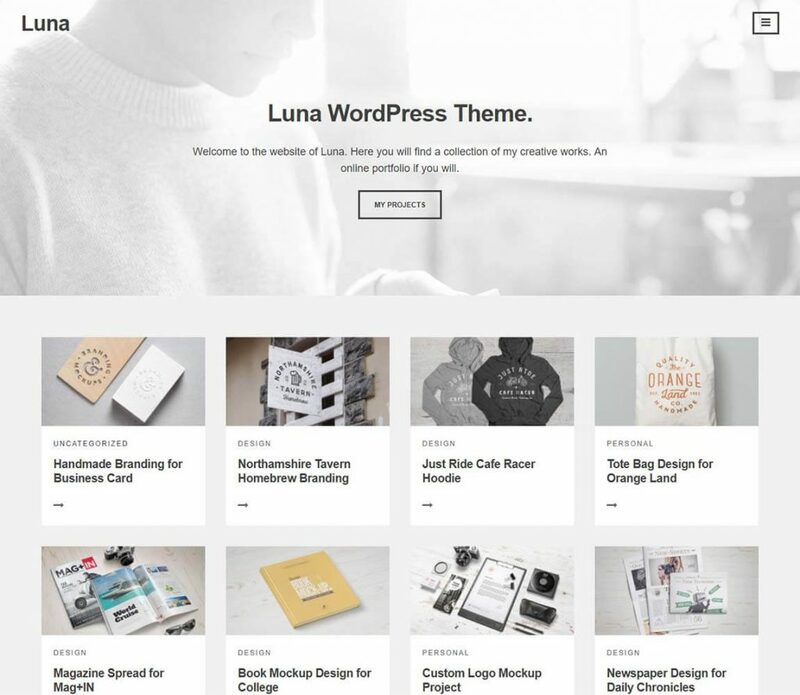 Luna, a beautiful WordPress theme highlights all of your projects in a sophisticated yet clean way. Featuring the SEO-friendly feature, this template also provides user with an unlimited color scheme option as well as a whole selection of fonts from the Google library. Adding to its amazing features, this template is also a cross browser supported, which means that this template works best with all the latest web servers like- Firefox, Chrome, Safari, IE 9+ and even Opera. Fulfills and maintains the standard required for a quality WordPress theme. Once you install the theme, you get the advantage of lifetime updates. One of the most elegant and clean looking templates, Oren provides you with the option make your work stand out. Especially suitable for photographers and designers to show off their amazing works, this template is easy to use and extremely customizable. Another amazing feature of this template that it fully supports Jetpack which means that you can use all of the awesome features for your website like tiled galleries. Built on the Bootstrap system, it is very easy to customize and robust as well. Fully responsive to all types of devices including tablets and mobiles. If a brilliant and standard looking theme is what you are looking for then, rest assured. We have just the thing for you, Hatch template. This is a simple and minimal WordPress theme which is fit for your photography designing and illustration portfolio website. It boasts the function of multiple options of typography and colors. Hatch also has a compatible and very responsive layout which also automatically detects what device the user is viewing your site. You can now download the free version from the official WordPress site. Responsive layout with the simple and minimal design. Multiple options of color schemes and fonts. 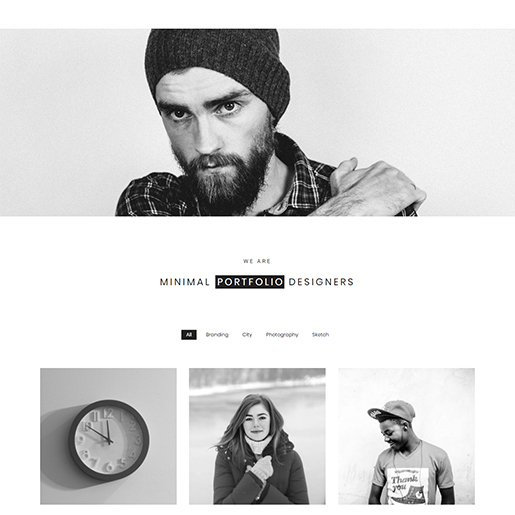 As its name suggests, Minimal portfolio is a free WordPress theme that sports a very minimalist design. Minimal Portfolio was also built using Bootstrap 4. This means that the theme is completely responsive on both PC as well as mobile platforms. Ensure that your images and product displays will resize perfectly to fit any given resolution scale or screen size. Moreover, Minimal Portfolio is built to impress and wow any website viewer. 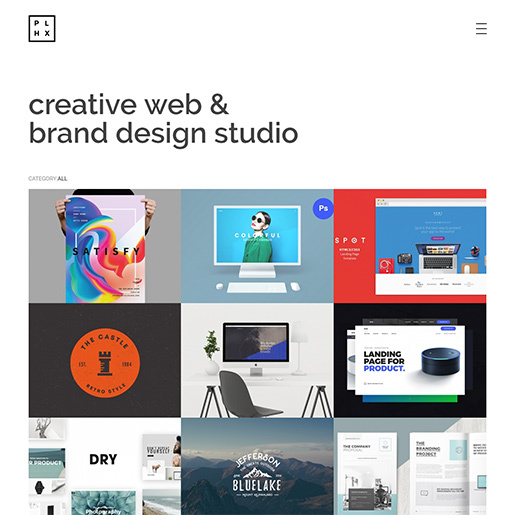 Nifty hover and animation effects, well designed minimalist portfolio grid and easy categorization allow you to display a wide range of art designs, fashion art, images and more in a very accessible manner. Added benefits of this amazing portfolio theme include RTL support, 4 different home page layouts, fully customizable theme options, and SEO friendly design. Minimalist Portfolio grid, website layouts and user interface. Mobile friendly as well as Cross-browser support. Fully responsive website design with retina ready features. Tons of nifty hover, parallax and animation effects. Phlox is a great WordPress theme to choose because of its amazing versatility. Fit for any kind of theme, Phlox deserves a position on this list because of its portfolio ready design as well. Not only does the theme provide amazing gallery tools and tons of theme options, but Phlox also comes with a pre-built Portfolio demo that you can use. You can use its one-click demo importer to instantly set up a portfolio website in a matter of minutes. Choose from 5 different home page portfolio designs as well as 3 different individual listing layouts. The nifty parallax features piled on top of this great WordPress theme only makes things much more awesome! Professional portfolio and gallery features. 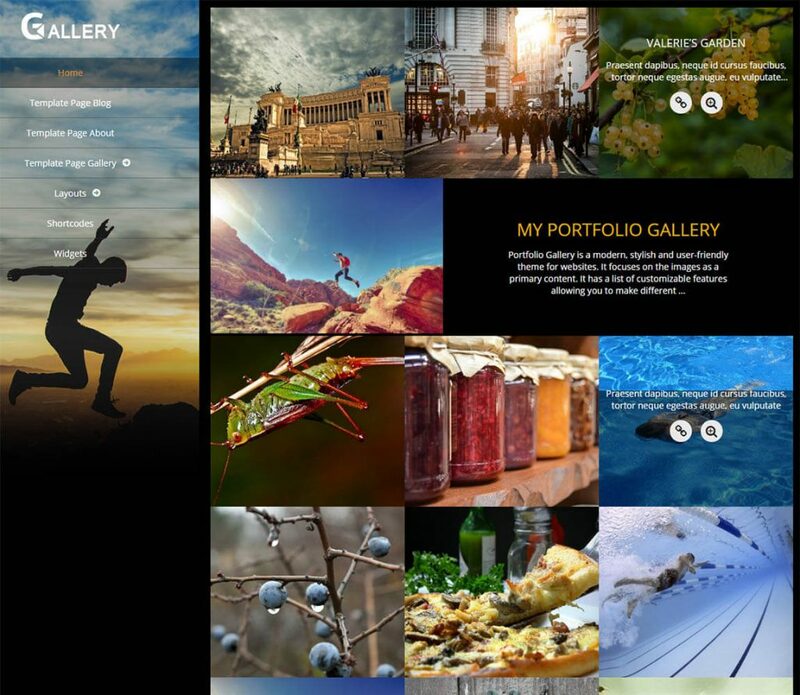 Custom layouts for galleries, portfolios and individual listings. SEO ready, GDPR compliant as well as Translation friendly. 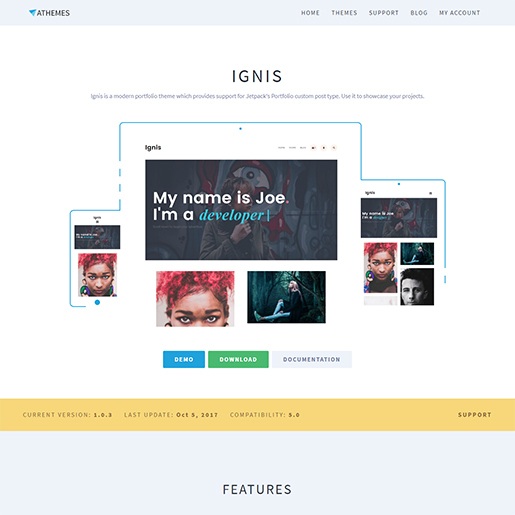 Ignis is definitely one of the coolest free WordPress portfolio themes available on the market. The entire portfolio browsing experience on Ignis seems almost seamless and impeccable. Enable breathtaking portfolios with hover effect and parallax effects for those massive presentation points. Ignis’ jetpack portfolio integration allows you to easily set up your portfolio and manages it. The tons of theme options provided by Ignis also allows for you to personalize your entire website. Finally, Ignis is also a great blogging WordPress theme. Choose from three different blog layouts and make great use of the various Google fonts bundled together with the portfolio theme. Well designed Portfolio grid and layouts. Image/Video header with accompanying text. Fully translation friendly with Cross-browser support. 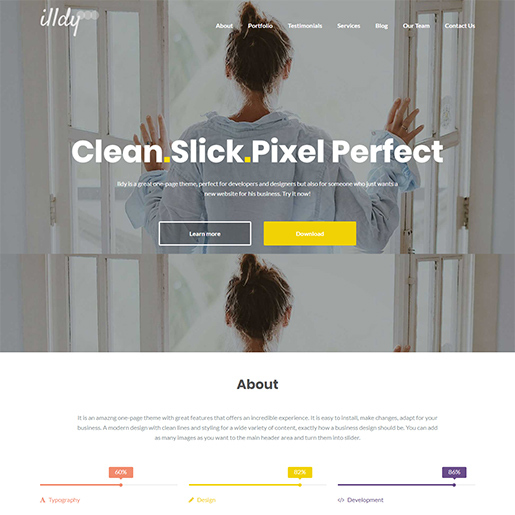 Illdy is a one-page portfolio theme made for independent developers, freelance artists and designers. This amazing theme is designed to have the best impression on any of your viewers. Each section is individually designed to fulfil a different function. About me sections, Progress bars, services listing, Social media links, you can enable them all individually on the same single page. You can also add other nifty sections such as Testimonials, Milestones, blogs. Of course, you can also enable an impressive dedicated Portfolio section using Illdy as well. All these features can be completely configured and customized alongside the theme’s layout using the customizer as well. Easy to set up, Highly responsive theme. Retina ready design as well as fully mobile friendly. Great clean layout with Parallax header. Bundled together with Font awesome icons, WooCommerce support, detailed theme documentation, etc. Did you like any theme from my list of free WordPress portfolio themes? If you liked any, hurry up to download and start making your portfolio. All these themes are well-coded and carefully designed so that you may find them easy to use. But if you find any issue, you can instantly contact the respective theme providers or ask your queries in WordPress support forums. Do you have some travel friendly themes which can i use for my travel based websites portfolio ? You can use any of the themes in the list for creating travel based websites. Flash is highly flexible and multipurpose so that you can use it for any purpose actually. How about page speed? Is there any difference between the themes and do you have any recommendation in that regard? We are glad that this helped you. And thanks for your concern regarding speed. Almost all the themes are fast-loading and lightweight. Tested on the Pingdom speed test tool, the first five themes in this list load in 1 or 2 seconds in average. Hi, nice list of free themes. Here you can include this theme in your list Noor its damn good free multipurpose theme. It’s an outstanding collection, my friend. Thanks for sharing with us.